When it comes to DPF cleaning equipment, FSX is the gold standard. All of our equipment is tried and tested in our own shops before it becomes available to you. This assures that our machines perform at an exceptional level and are of the highest quality. Attempts to clean 5,000 cells at once. Center cells clean first, while outside cells get little cleaning. 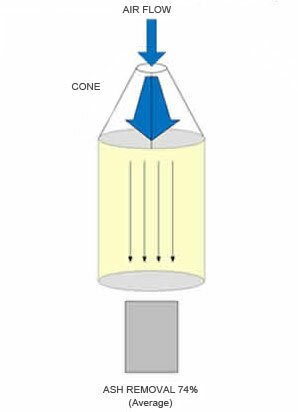 Cleaning stops when a path of least resistance is established, typically through the center of the filter only. 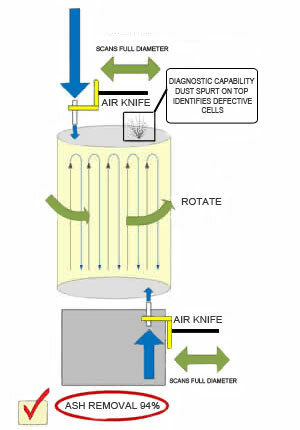 Cleans using Air Knife Scanning technology (patented) on both ends of the filter. Every cell is cleaned numerous times from both directions, providing visible diagnostics and cleaning process. MAXIMUM & MINIMUM HEIGHT DIMENSIONS OF FILTER 20" 20" / 13" 36" / 5"
MAXIMUM & MINIMUM DIAMETER OF FILTER 15" / 8" 15" / 8" 20" & 3"